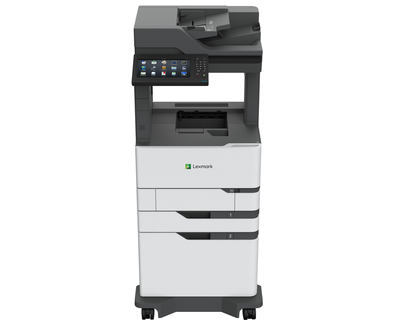 With output of up to 66 ppm*, Ultra High Yield toner capacity, optional finishing and 2,750 sheets of standard input, the MX826adxe is Lexmark’s large-workgroup monochrome leader. A first page as fast as four seconds sets the stage for printing and copying at up to 66 ppm*, backed by the powerful combination of 1.2-GHz quad-core processor and up to 6 GB of memory. Single-pass two-sided scanning at up to 144 spm completes the speed equation, bolstered by bigger-than-ever 200-page document feeder capacity and ultrasonic multifeed detection to help make sure every page gets scanned. With access to standard input capacity of up to 2,750 sheets, replacement toner cartridges that go as high as 55,000 pages**, long-life imaging unit and fuser that may never need replacement, you’ll spend more time printing and less time doing maintenance. Steel frames and a robust paper feeding system that reliably handles diverse media types and sizes support heavy-duty use and a long life in even the harshest environments. Plus, innovations in part replacement and accessibility help you resolve problems quickly. ** Average standard page yield value declared in accordance with ISO/IEC 19752. *Average Continuous Cartridge Yield in one-sided (simplex) mode 11,000 standard pages. Declared yield value in accordance with ISO/IEC 19752.